We aimed to experimentally assess the role of cognitive processes in provoking anxiety and compulsive behaviours in young people with OCD, and to determine whether specific cognitive appraisal subtypes (e.g., threat) best explain OCD symptoms. 29 young people with a principal diagnosis of OCD, 30 young people with an anxiety disorder other than OCD, and 25 young people meeting no diagnostic criteria completed a sorting task designed to increase or decrease responsibility/threat biases. We expected that OCD participants in the high responsibility/threat group would demonstrate higher scores on subjective (belief and anxiety ratings) and behavioural variables (e.g., urge to check, time taken to sort) compared to anxious and nonclinical control groups. Young people with OCD in the inflated responsibility/threat condition were more anxious and showed enhanced delay behaviours (e.g., slower on the task, more time checking) compared to control groups, who were not affected by the manipulation. Regression analyses revealed that threat appraisals played a more prominent role than responsibility beliefs in state anxiety ratings, overall time taken and time spent checking. 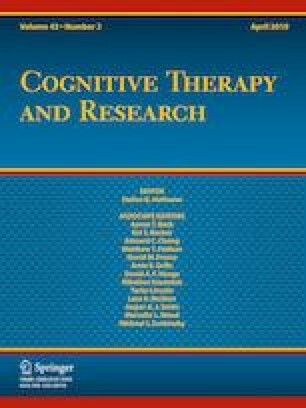 The present study supports cognitive models of OCD showing a clear relationship between inflated responsibility beliefs, threat beliefs and perfectionism levels and OCD-related behaviours. We would like to thank the young people and their families who participated, Rivendell Hospital staff, as well as Benjamin Chen, Aberdine Donaldson, Alice Lo, and Chloe McGrath for their research assistance. We have no funding sources to declare and have received no funding from external sources. Sharlene Mantz, Margot O’Brien, Felicity Waters and Maree Abbott declare that they have no conflicts of interest.